The Missing Ingredient in Your Next Recipe! Lazies, Wouldn’t it be nice to have just the right bite-sized pieces of supplies for your next project? Something measured, cut, packaged, and labeled so you know what it is? Just like those meal delivery services that send you a kit of this, that and the other. I’m introducing project-sized cuts of our popular line of interfacing for your next tasty creation. Read on for juicy details and a giveaway! Most of my projects need about a half yard of interfacing or fleece. So each of the project-sized pieces are about a half yard, or two fat quarters’ worth of goods. These beauties have the same color coding, graphics and information as our interfacing on the bolt. So you’ll know exactly what it is and how it will behave in your project. Here’s who is packaged and ready for you. Slicker can be used with the new Glo and Go pattern from ByAnnie item PBA269. Stiff Stuff will be joining the lineup when we have product back in stock in January. I can’t wait!!! Debuting at Quilt Market next week in Houston, these cuties are pretty enough to display with the good china, so to speak. Stop by Brewer and Checker to see them in person. Get your interfacing up off the floor, out of the corner, in from the other room, and let it sell itself through its packaging along side patterns, on display shelves, etc. The cuties are kit-ready, too. They’ve been measured, cut, folded, labeled and packaged, saving you time, staff, and guess work. Product numbers are the bolt item code plus the number ‘1’, as in, I’ll take one, please. – Enter by using Rafflecopter below. – One winner will be chosen. – Giveaway ends Wednesday, October 25, 2017. – I’ll contact the winner via email. Remember to Comment: Tell me your favorite Lazy Girl interfacing. Joan, As a follower of your bags for many years now I’m am always surprised at your ingenuity (although I should not be!). This is a brilliant idea! Love the fusible fleece for my small projects, So easy to use and gives a good amount of body!! Any of them that help me make my project better. They are all great! I love Face-it Firm interfacing. I would love to try your new product all your new face it firm sounds great.I hope you will tell us were we can by it. I really like the Dreamy Fusible Fleece, but they all add something different to a handbag. I like the Fusi-bond Lite. 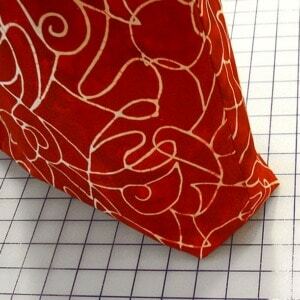 I would love to try the new interfacing – haven’t had a chance yet! 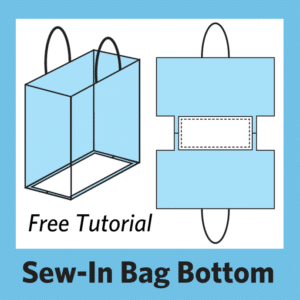 Would love to try your special interfacings and stabilizers on a fresh new tote! Yummy!!! My favorite is dreamy fusible fleece. Really excited to try these out! Thanks for the chance to win! Dreamy fusible fleece is my favorite. My favorite Lazy Girl interfacing is the Dreamy Fusible Fleece. I make bags, glasses cases, makeup bags, and many more and love the Dreamy Fusible Fleece. Love your patterns Joan. Joan, you are correct it is Dreamy Fusible Fleece. I love the firm fuse! I love the dreamy soft fusible. 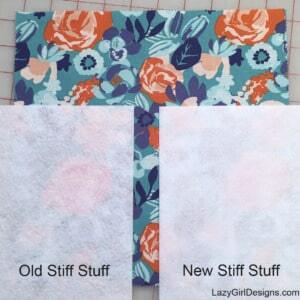 Stiff Stuff is my favorite interfacing … it’s the bomb! P.S. my all time fave isDreamy! I like fusible the fleece. What a great idea. It is always disappointing when deciding to make a pattern and then do not have the correct interfacing, etc. 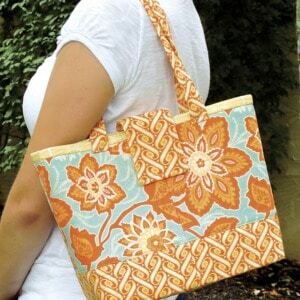 I loved making the Margo bag…. it’s been awhile – I should make another! I don’t believe I’ve tried any of your interfacings yet! Would love the chance to do so. Thanks! I have a few Lazy Girl patterns and they go together well. Love them. I like the Dreamy Fusible Fleece package best. 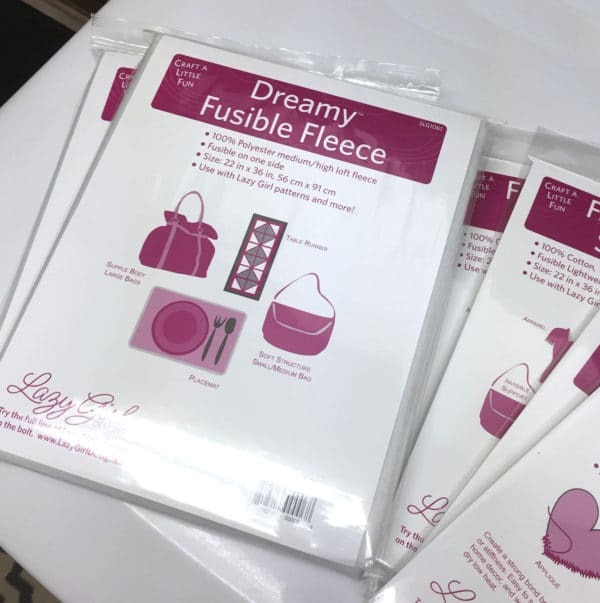 My favorite is definitely dreamy fusible fleece!!! Dreamy Fusible Fleece – great for giving my totes some structure and a nice soft feel. I like Dreamy Fusible Fleece the best. Fuse bond lite. But then all are really nice for making bags. I haven’t used any yet but am real interested in the dreamy fusible fleece. 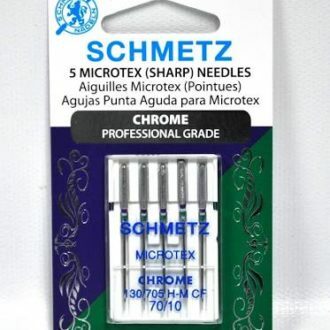 Thank you for packaging the most frustrating part of sewing–the right interfacing, stability product, etc. for the right job. Seems I never have one or more of these when I go to start a project. Another wonderful Lazy gift to sewists. This is so smart! my sewing studio is the size of a large closet, meaning everything takes up room – how smart to get exactly what you need for a project. Awaring my favorit supply – so far – stiff stuff, which is one heck of a smart and lazy solution. FaceIt Firm for me! What fun- project sizes! I love using Fusible Fleece in projects. I like the fusi-bond lite! Love you purse patterns. I think I have them all,but your interfacing line is new to me. I LOVE THE DREAMY FUSIBLE FLEECE!!! Dreamy fusible fleece is really a dream to use and it gives the purse a professional appearance. 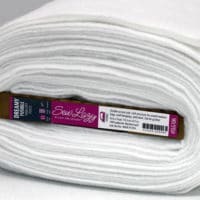 Love Fusible Fleece-easy to use and perfect for many jobs. Also like Face-It Firm. Thank you for an opportunity to win! I like the fusible dreamy fleece. Sounds like a good plan to me, it would prevent a lot of waste. Interfacing is so confusing; what should I use. What a great idea! Pieces that are just the right (small) size is wonderful, especially for Dreamy Fusible Fleece! My favorite is dreamy fusible fleece. Fusible interfacing makes projects go so much more quickly! ? What a great idea! This would go so well in my little shop! Your products already have a front row seat here so time to add to the display! I love dreamy fusible fleece, it is so easy to use. Love that I will be able to grab a kit when traveling and didn’t plan ahead but will still be able to work on a project. I haven’t used any of the interfacings before, but would like to try the Dreamy Fusible Fleece on my next project. I love fusible fleece! What a great idea to help us stay on task and organized! So creative and clever! Fusible fleece is what I use the most, It is so versatile that I buy it by the bolt. Love the Fusible Fleece! And LOVE this bag! What a nice giveaway! I’ve used & like the lite bond. Have been wanting to do a purse for sometime so this would be perfect, thanks for chance. I have so many of your patterns (love all of them) ! Would love to try your interfacings , as I haven’t had a chance yet! I love the Stiff Stuff. Fusible fleece is wonderful, I don’t think I’ve seen the Lazy Girl one yet. I did try out some of your LG iron on vinyl, love it. It’s a little hard to find here. What a great idea! Needed this for a long time! I bought the Fusi Bond Lite and it was great stuff! Plan on making some bags for Christmas gifts. Just like the other gals, nothing worse than getting ready to start a project and you don’t have all the “ingredients”. Ughhhhhh. I haven’t tried many of the products since I’m using up what I have. Perfect!! 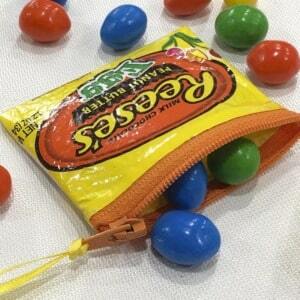 I need to look into the materials for the Miranda Bag so I can get what I need. Perfect for trying out new to me interfacings. I haven’t tried any of the interfacings yet, as I am using up what I already have first. I have used and love the Lazy Girl patterns. Once I run out of interfacing, then I will try some of the Lazy Girl interfacings. Dreamy Fusible Fleece is the best! I love using fusible fleece in my bag projects. I use other interfacing too! I haven’t use these interfacings yet but I look forward to trying them all! 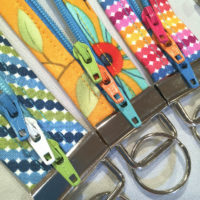 I would love to try these interfacings, especially the fusible fleece! Thanks for the chance. I would like to win this package because I haven’t had the opportunity to try out this product as of yet and I really need to make myself a new bag. I haven’t got to try LG interfacing before. I would love to. The patterns are amazing. I have a good number of the LG patterns and recommend them to my friends. I have not tried any Lazy Girl interfacing yet but I love the patterns I’ve tried! I do like all the interfacing that you have. 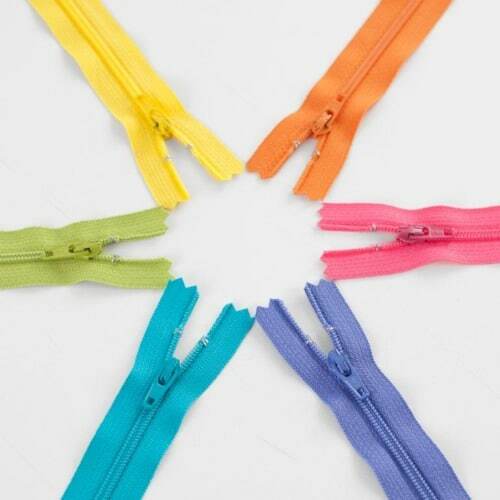 They each have their special place in sewing. I did not know there was anything else besides Dreamy Fusible Fleece. Usually use soft and stable! Love, Love, Love Lazy Girl designs! Easy to follow and stuff I actually can use! I haven’t tried an of the interfacings but I have used several patterns and they are well written. Hands down, my favorite is the Dreamy fusible fleece. Can’t wait to use it again! I haven’t used your interfacing (yet!) but it sounds like I have to real soon. I LOVE your patterns and have made quite a few of them. I haven’t tried your interfacing…yet….would love to win! I haven’t tried any yet, but I would love to try stiff stuff. I love the Dreamy. It has a softer feel than other brands. Haven’t tried any of your interfacing, i would love to tho! I’m absolutely loving your patterns! I am yet to try any of these products but I would love to! Slick Stuff is my fav—I like to make little makeup bags, like Becca, and it makes them easier to keep clean. Looking forward to your new interface packaging – I haven’t seen it locally yet! Haven’t used lazy girl interfacing yet, but it’s definitely now on my need-to-buy list! I like the name of the Dreamy interfacing… ? but to be honest, I haven’t tried any of them. ? Thank you for the giveaway! Sorry it would not let me comment on my submission, but would love to try the firm on the Margot purse. 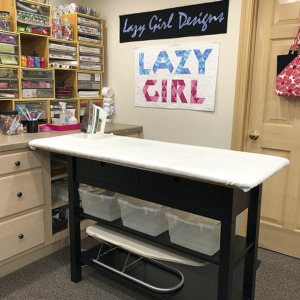 Have never heard of lazy girl interfacing.. Now that I saw this post..amazing..I want to try..I have made more Margo bags than I can count though. That is my all time favorite purse…. Just bought some but haven’t tried it yet. Love the patterns! Love your patterns, have made several! 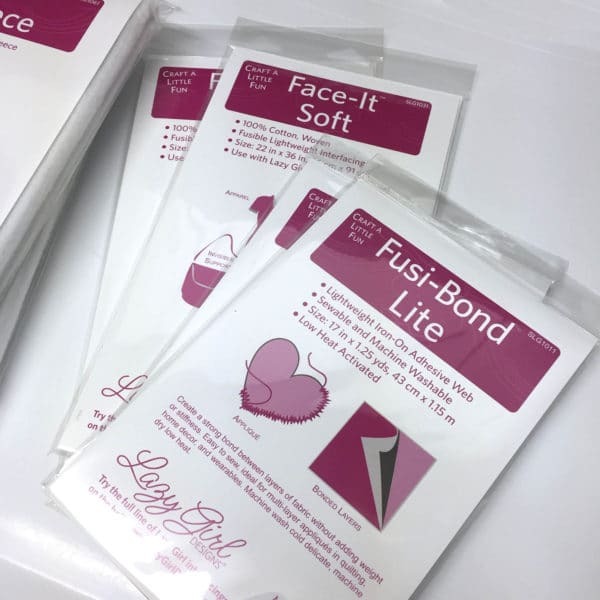 Fusi bond lite, so much fun to use! I just discovered your products while on a trip. I can hardly wait to get home to sew! 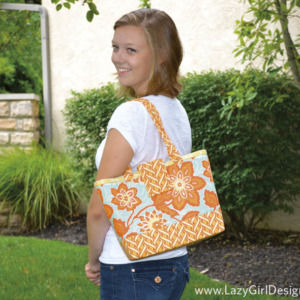 Love the Lazy Girl patterns…..and also the LG interfacing that I’ve tried….it is the best. I haven’t been doing much sewing lately… I have used fusible fleece in the past, but think the Face-It Firm non-woven med/heavy interfacing SLG1041 would be perfect for my future needs. Thanks for the giveaway opportunity. I love all your patterns and I’m sure the interfacing will be a perfect companion to them. Hi Joan, I love you happy creative patterns. I’ve only used one stabilizer and it was a little thick. Love the little pea pods and I want to make some with my granddaughter! Best of luck with your new product. I haven’t had the chance to use any Lazy Girl interfacings yet. This is the perfect opportunity. Love Lazy Girl patterns, so look forward to trying the interfacings! Haven’t tried any yet, but certainly will. I like the Face-It Firm. This is great and will make life and sewing just that bit more pleasurable. I would so love to win not only the interfacings but the chance to make a great bag. Love the Dreamy Fusible Fleece. Thank You! I haven’t used any Lazy Girl interfacing before, but I would love to try it! I live love love the dreamy fleece!! I think Dreamy fusible fleece is my favorite. But I also really like Fusi-Bond Lite and Face-It Firm. 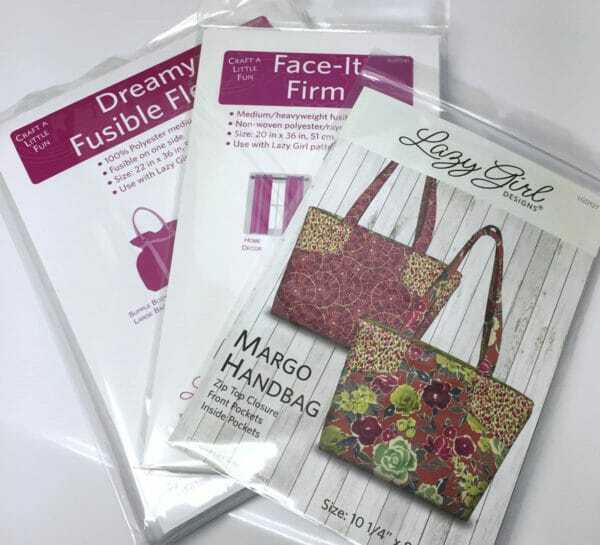 I have used Dreamy fusible in quite a few bags and I love it. I haven’t tried Lazy Girl interfacing yet, so I can’t have a fave, but I would love to try it soon. It will be nice to be able to find all the right products and not have to guess which ones to substitute when you can’t find the originals! Love working with Bonsai for bags. I love making all kinds of bags Dreamy fusible fleece. have not used lazy girl interfacing yet, but plan to try it soon! Are these new fun thing for sale yet?? I didn’t see them yet on Brewer’s site. I cannot wait to have them in my shop. Your products have a whole 4 way spinner…yes, everything you do are my favorites! !